On October 12, 2018 I was announced as a PitchWars mentee and it was one of the best moments of my writing life. I’ve followed PitchWars for years and have even applied to the mentorship program before, so I already knew the amazing experiences that could come from it. Or at least I thought I knew. Nothing could have prepared me for the sense of community and belongingness that came from the other mentees, the friendships I made with my mentors Sabrina Lotfi and Carrie Allen, the amount of work I put into my manuscript, or the confidence I now have. 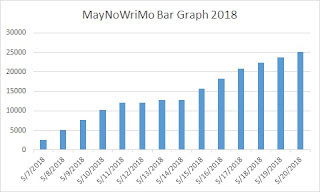 The last four months have been a blur of writing and revising. That’s clearly true from the fact that I haven’t updated this site in months (! ), but I knew my time was better spent on my manuscript. So now that the last edits have been made to HOT BRITISH BOYFRIEND and the Agent Showcase is behind us, I figured it was time to reflect a bit on these last months. Not only was I lucky enough to get into PitchWars, but one of my closest friends--Kathryn Powers-- also made it in! The night of the announcements we were anxiously texting back and forth, waiting for the website to update. I was a pulsing ball of nerves! Kathryn saw the news first and after LOTS of squeeing, gifs, and dancing, we did the only sane thing we could: celebration pancakes at IHOP at 3am! Lol! The timing was perfect because we’d already planned a writing retreat in Hocking Hills in November. What a luxury to tuck myself away from the world for a few days and start revising! Sabrina and Carrie were (and continue to be!) the most amazing cheerleaders as I revised. 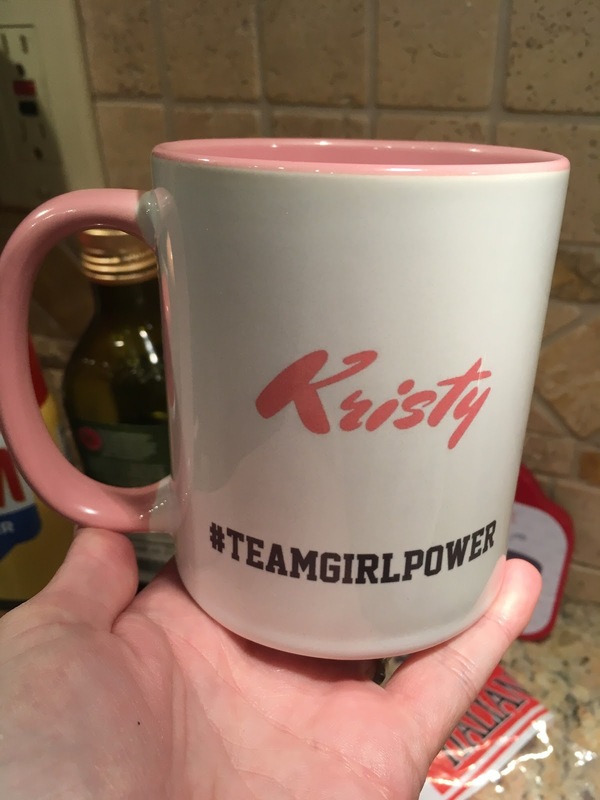 Here is my very own #TeamGirlPower mug! Over the months, we exchanged presents and way too many emails, DMs, and gifs to count. :) I’ll always be grateful that they saw the potential in my manuscript and also gave me the direction to make it even better. I’m not going to say PitchWars was easy. Absolutely NOT. It was one of the hardest things I’ve ever done, particularly because I was balancing family and a full-time job while doing it. For months I spent every night in my office, revising and revising and revising. No matter what the future holds, this is an experience that I’ll always hold dear to me. I’m so sad that it’s over! But, as Carrie told me, it’s only the end of the beginning. And just like that...it's September! Since my birthday is this month, I do have a soft spot for this month, but I'm still a little sad that we're already here. The next few months are going to be crazy with school, revising, conferences, book festivals, birthdays, etc. Hopefully I can find a way to balance everything without going totally nuts! Overall, August was a very good month. I actually read 7 novels this month, which I still can't believe, so I'm feeling really productive about that. And I entered Pitch Wars (a mentorship program) this year. The last time I applied was in 2016 and it was a great experience so I'm excited to apply again. Plus, I have a few friends who applied so it's been fun to go through everything together this time! Lots more audiobooks this month as I transitioned back into the school schedule. Hoping to continue the productivity into the fall! The summer continues to fly by quicker than I'd like. In only a few weeks I'll be back to teaching at OSU. 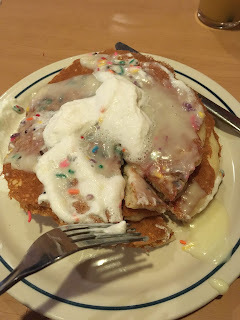 It's a particularly bittersweet time too because my son is starting kindergarten this week. I'm excited for him, but also sad because he's growing up. It's definitely a new phase of life! 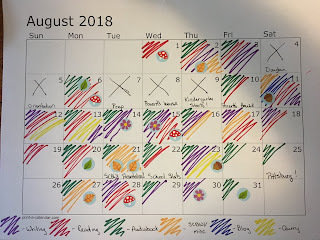 I used the end of June and July to brainstorm about my new WIP, a Middle Grade fantasy that I’m calling The Fairy Gardener. I wrote the rough draft last May, but it was clear I needed to do a lot of work on worldbuilding, character motivation, and--you know--filling plot holes before I began revising. In order to visualize what I had and what needed to be added, I pulled out my trusty IKEA paper roll and all my highlighters! 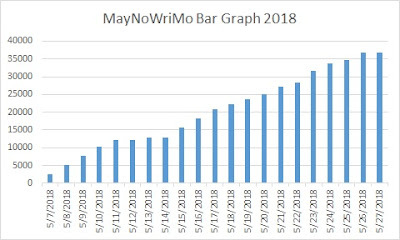 I’ve used different tricks with my other manuscripts (see here and here and here), but this made the most sense for now. Plus, I’ll be able to tape this to the wall in my office as I jump into my revision! Color-coded highlighters for the win! Beginning a big revision is always intimidating, but I have to remember that I've done it before and it will get easier as I make more progress! And below is my July calendar. I took off every Saturday this month so I could spent time with family and friends and I have no regrets! 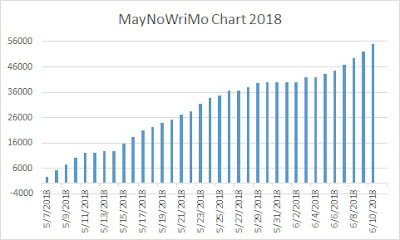 Well…with everything going on during June I may have gotten behind on posting about MayNoWriMo. But the good news is I FINISHED!!! Whooo-hooo! The draft came in at 55k words and took me a little longer than a month, but that’s totally fine since I just care about finishing it. 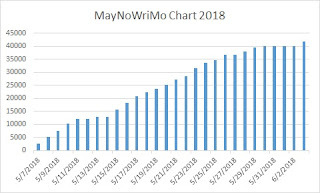 J It’s very rough—of course—but it feels SO good to know that I have a new complete YA draft to start revising when I’m ready. For now though, I’m letting it rest and moving back to revising my MG fantasy draft. 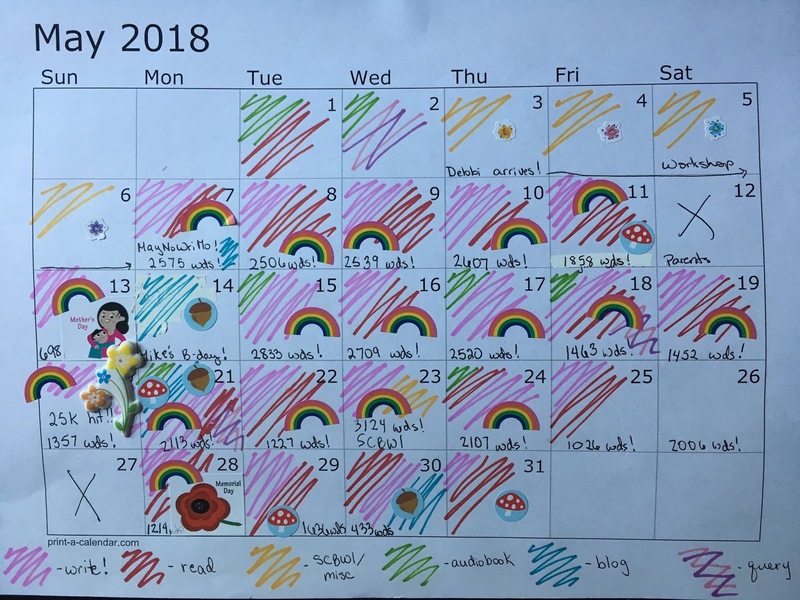 A very busy and productive month! June is always full of non-writing activities as well. I started teaching my summer class, spent time with friends and family, and threw my son his 6th birthday party! I can’t believe we’re only a few days away from July 4th already! During the summer, time really REALLY flies by but I’m trying to make the most of it. Hopefully I can find a good balance between writing, teaching, and relaxing for the rest of the summer! I wasn't able to write an enormous amount this week, BUT I'm still proud of myself for hitting 40k! In the future week(s) I'll keep plugging along until this manuscript is finished. Until then, every little bit counts! Wow, three weeks done! 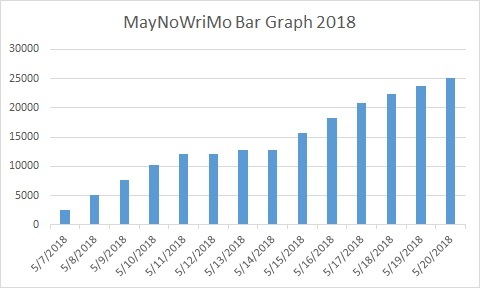 I'm feeling bittersweet about this because it means that May is coming to an end. Although there are lots of other fun things to look forward to this summer, May is my favorite month of the year so it's hard to see it depart for another year. Luckily, I made good progress again this week! I set a slightly lower goal for this week of 10k (which I still think it pretty impressive). I wanted to set an ambitious goal, but also one that was attainable. I was able to hit my word count goal again this week and I'm feeling really good about my progress. 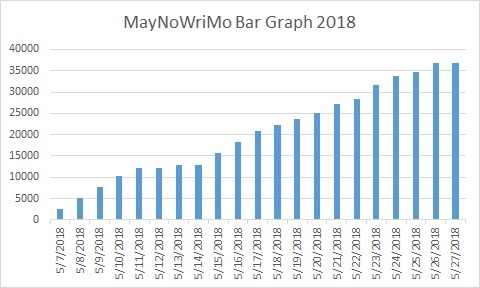 It was definitely hard to push through some days and I'm feeling a bit worn down, but it's all worth it when I look at that word count! 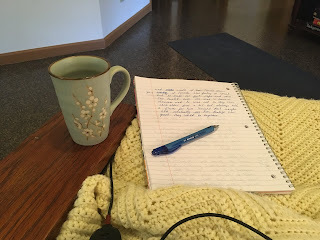 Writing has been a life-long passion for me. I first began writing stories when I was in elementary school, although these mostly included stories about barbie dolls, Candy Land, and my "Magic Universe," which was an entire universe of magical worlds where all my stuffed toys could live. 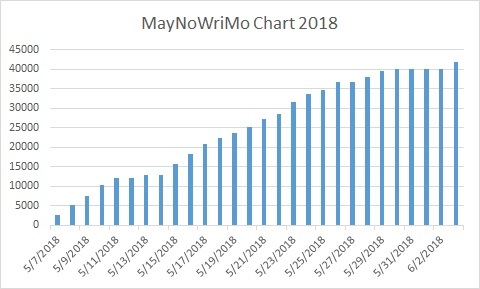 I started my first real novel when I was probably 13, and although I never actually finished it, I did manage to rewrite the first half again and again...all the way through grad school! I've finally put that project aside, but I continue to be an aspiring writer for both children and teens. When I'm not writing and reading, I teach social and personality psychology full-time at The Ohio State University and spend time with my husband and son.